MEA spokesperson says Pakistan continues to be in denial, and has not shared details of credible action against terrorists or terror organisations. New Delhi: India has said it is “disappointed”, a day after Pakistan said it had come out with preliminary findings on the dossier that New Delhi had shared on Jaish-e-Mohammed’s role in the Pulwama terror attack. “India is disappointed at Pakistan’s response to our detailed dossier on the Jaish-e-Mohammed’s complicity in the cross-border terror attack in Pulwama, the presence of its terror camps and leadership in Pakistan,” Raveesh Kumar, spokesperson for the Ministry of External Affairs (MEA) said Thursday. He said Pakistan “continues to be in denial and even refuses to acknowledge Pulwama as a terror attack”. The 14 February suicide attack in Pulwama, Jammu and Kashmir, killed 40 CRPF personnel. “It has not shared details of credible action, if any, taken by it against terrorists or terrorist organisations based in territories under its control,” Kumar said. However, the MEA spokesperson said India was not surprised at Islamabad’s response, as it was the same even after the 26/11 Mumbai attack in 2008 and the Pathankot attack in 2016. “It is a well-known fact that the UN-designated terrorist organisation Jaish-e-Mohammed and its leader Masood Azhar are based in Pakistan. This was again acknowledged recently to international media by Pakistan’s foreign minister. There’s no dearth of sufficient actionable information and evidence in Pakistan itself to take action against them, if there is sincerity and intent to do so,” he said, adding that New Delhi is examining the paper handed over by Islamabad. 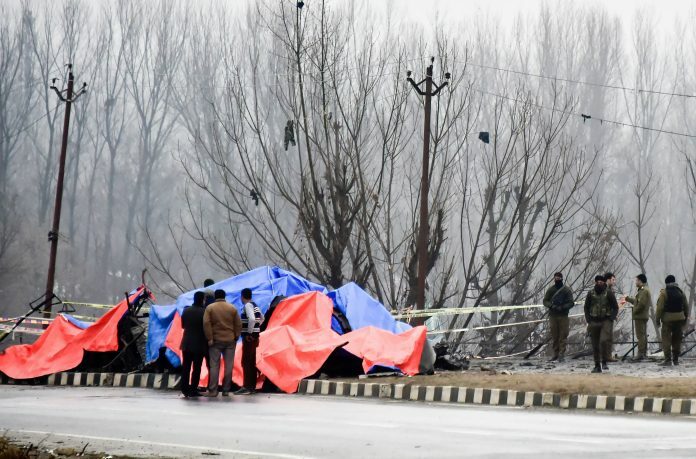 Earlier in the day, Pakistan’s foreign ministry stated that it could allow India to investigate the alleged terror camps New Delhi believes were linked to the Pulwama attack. “The 22 pin locations shared by India have been examined. No such camps exist. Pakistan is willing to allow visits, on request, to these locations,” the Pakistani foreign ministry spokesperson said Thursday in a press release. Pakistan has also briefed the foreign diplomatic community based in the country on the findings. “During the course of investigations, all aspects of the information provided by India have been thoroughly examined, including the ‘confessional’ video of Adil Dar (the Kashmiri member of the Jaish-e-Mohammed who allegedly carried out the Pulwama attack), ‘claim’ of responsibility for the attack (by the Jaish-e-Mohammed), WhatsApp and Telegram numbers used to share videos and messages in support of Pulwama attack, list of 90 individuals suspected of belonging to a proscribed organisation, and 22 pin locations of alleged training camps,” the release said. The Indian dossier contains 91 pages and six parts, of which only the second and third parts pertain to the Pulwama incident, Islamabad said. The other parts are generalised allegations, it added, saying Pakistan is focusing on those that relate to the Pulwama attack. Pakistan said it had detained 54 suspects but found no evidence that they were involved in the Pulwama attack.